Best use of stale bread ever! 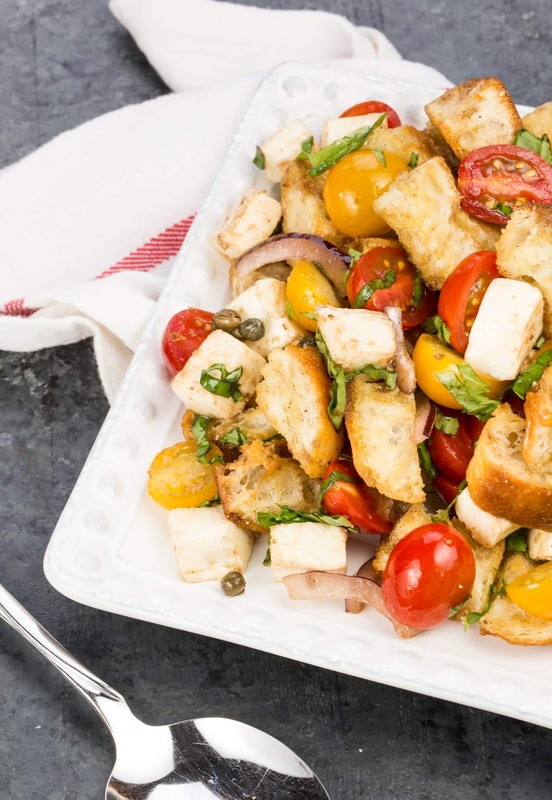 Grab the freshest tomatoes you can find and enjoy the simple but addicting flavors of this Italian Panzanella Salad all summer long. We really try to eat seasonally in our house. Part of that is by design because food just tastes better when it’s at its peak (even more so when it’s from your backyard!). But we also eat seasonally out of necessity because our Minnesota growing season is so short. I occasionally make dishes out of season if I find some can’t-be-beat produce at the store. But never Panzanella. This salad is summer in my mouth. There is simply no comparison during any other time of year. I can (and do!) eat this Panzanella Salad a few times a week once the weather starts to warm up. It’s my go-to when friends come for lunch, and it packs well for field trips and picnics with the kids. I’ve made it as one large salad for gatherings as well as kept the prepped bread and other ingredients separate in order to create individual portions throughout the week. I usually let my bread cubes bake a little longer than some so they are extra crunchy and retain a little bite after the dressing is added. Speaking of the dressing, it couldn’t be simpler to prepare, and the briny capers give a deliciously salty kick to the balsamic vinaigrette. Find the freshest tomatoes and mozzarella you can, and you’ll be rewarded with all the flavors of summer in one bite. Tip: Looking for something a little heartier for dinner? Grilled steak is fantastic with this salad! Place baguette pieces in a large bowl. Drizzle with 2 tablespoons olive oil, ¼ teaspoon salt and pepper. Toss to coat. Spread bread cubes on a sheet pan and bake for 15-18 minutes or to desired degree of toastiness, stirring once. Set aside to cool. Combine ½ teaspoon salt, garlic, balsamic vinegar and capers in a small bowl. Gently whisk in 1/3 cup olive oil until combined. Set aside. Stir together bread cubes, tomatoes, onion, mozzarella and basil. Pour balsamic vinaigrette over bread cube mixture and stir to coat. Allow the salad to sit 30 minutes before serving. Prep time includes 30 minutes of salad sitting at room temperature before serving. Panzanella is one of the recipes that for one reason or another I never made at home. Not sure why, as I find it delicious whenever I order it in a good Italian restaurant. Hi Sally, I hope you give this version a go at home and let me know what you think. Thanks for stopping by! I was always wondering what is Panzanella. It looks so yummy. And doesn’t sound like too complicated to cook at home. thank you for the recipe. Now not only I know what Panzanella is, but how to cook it! Give it a try, Elena. It’s a favorite of mine, and I hope you enjoy it, too! 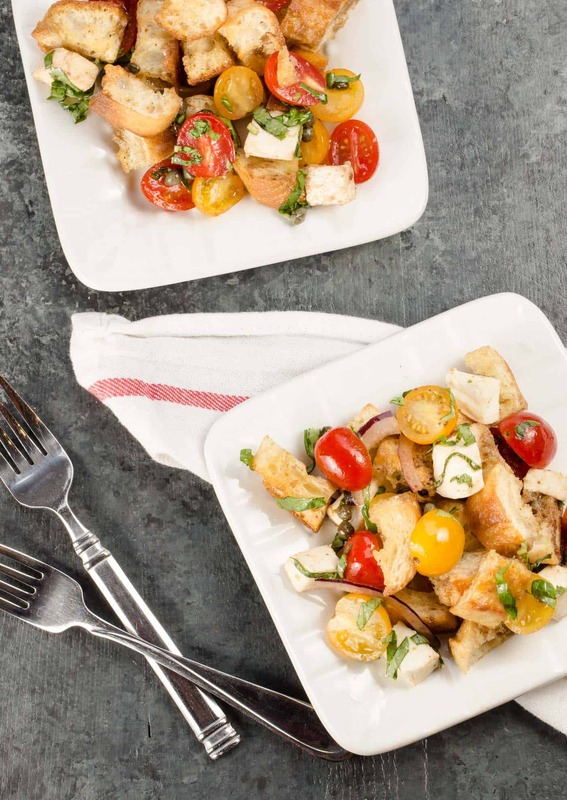 I love a good panzanella, and yours looks perfect, Anna! I’ve never made my own panzenella…yours looks perfect! I hope you try it, Autumn, and love it as much as I do. Thanks for stopping by! Could this be made with purchased croutons? Never done it, but I don’t see why you couldn’t try. You’ll probably have to let the dressing soak into the prepared croutons longer simply because they are drier than the toasted bread cubes. And be sure to buy larger croutons without any added flavor (like cheese or ranch). Let me know how it turns out! This was delicious!! A new go to fav. Thanks! So glad you enjoyed it, Janice. It’s one of my favorite summer meals. This was amazingly, wonderfully delicious. We could do without the onion, but it was ok with it too. Will definitely be a summer go-to of mine from now on! Thanks for the recipe! Yay! I’m glad you enjoyed it. Another great option for those baskets of August tomatoes. Thanks for the comment, Emily!